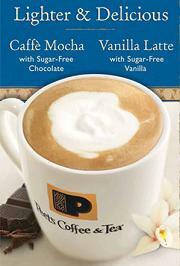 Home ♦ Coffee Shops ♦ Deal on Peet’s “Lighter” Drinks! Deal on Peet’s “Lighter” Drinks! To celebrate the launch of their new “lighter” drink options, Peet’s Coffee and Tea put out a coupon that allows you to buy one “light” drink, get another drink (of your choice) for free! The coupon can be found here and is good through January 18th. The lighter drinks are made with sugar free syrups, which are a new addition to the regular lineup of flavor options at the West Coast coffee chain. The syrups are available in Chocolate and Vanilla flavors. While I tend to prefer the full-sugar syrups when I’m having a flavored drink, it’s great that they’re offering these because I hear lots of requests for them from customers. That being said, I’ve only had bad experiences with sugar free chocolate syrups in the past and a free coupon is perfect way to try one and see if Peet’s new drinks stand up to the rest of their strong coffee lineup.